Thomas Hart Benton (1889­–1975), Hollywood, 1937–38. Tempera with oil on canvas, mounted on panel ©T.H. Benton and R.P. Benton Testamentary Trusts/UMB Bank Trustee/Licensed by VAGA, New York, NY The Nelson-Atkins Museum of Art, Kansas City, Missouri, Bequest of the artist. 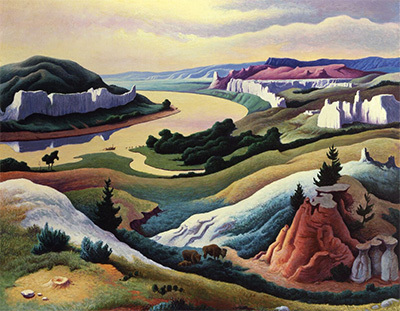 Thomas Hart Benton (1889­–1975), The Kentuckian, 1954. Oil on canvas © T.H. Benton and R.P. Benton Testamentary Trusts/UMB Bank Trustee/Licensed by VAGA, New York, NY Los Angeles County Museum of Art, Gift of Burt Lancaster, Photo courtesy of LACMA. American artist Thomas Hart Benton’s works are often described as “larger than life,” and that’s not a cliché. Benton, a Missouri native with a Hemingway-esque capacity for drink and storytelling, is well-known for his folksy, Americana-inspired, large scale murals which can be seen both at the Capitol building in his home state and in New York, where the painter took up residence briefly. American Epics: Thomas Hart Benton and Hollywood, a series of paintings, lithographs and prints from the early 1920s through the 1940s, will be on display at the Amon Carter Museum of American Art Feb 6. through May 1. Benton was the scion of a Midwest political family: His father was a four-term congressman from Missouri, and his namesake great-uncle was a senator. But Benton determined not to follow his family’s political path, becoming a cartoonist for a hometown newspaper instead. His mother encouraged her son’s artistic studies, first at the Art Institute in Chicago, then in Paris at the Académie Julian. Benton came back to New York, dabbled for a while in modernist styles, and ultimately swerved away from European Impressionism into anti-modernist Regionalism, a uniquely American genre springing from the Great Depression. According to Maggie Adler, assistant curator at the Amon Carter Museum, Regionalism represented an “exaggerated nostalgia” about Americana. 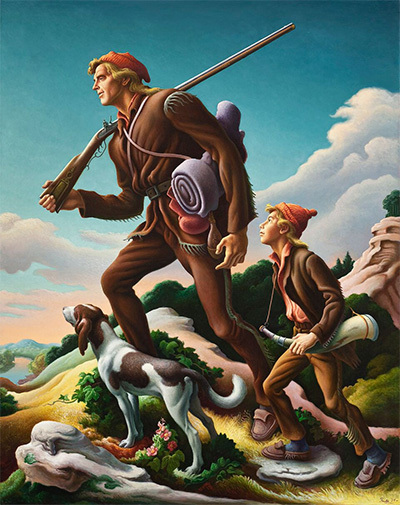 Some of the nostalgia is not always pleasant­­; Benton’s American Historical Epic series, painted in the 1920s, shows the good, bad, and ugly side of American colonialism. Benton was celebrated on the cover of Time Magazine in the 1930s for his work as a mover in the art world of that time. Interestingly, artist Jackson Pollock was initially a Benton protégé. It’s hard to imagine a more unlikely match than Benton and Pollock, but in reality, the artists had much in common, including their well-documented vices. Adler points to the way Benton set up his canvases, laying the space with geometrical blocks to suggest scope and scale prior to the painting, and says that Pollock used a similar technique. “The stretched out massive canvases, and elongated shape and rhythm: Pollock did that, too” she says. Benton’s love affair with the movies began during the heyday of silent films, which were produced in Fort Lee, N.J. Benton was a set-painter around 1913, according to Adler. As the film capitol moved from the East coast to Hollywood, Benton set off for the West. 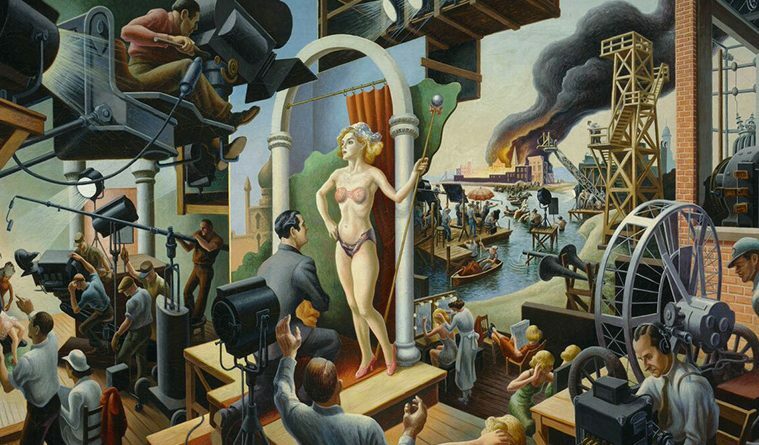 Shortly after he was Time Magazine’s cover boy, Life Magazine commissioned Benton to paint a series of movie murals about the movie industry. Benton met director John Ford with whom he would develop a “symbiotic relationship,” according to Adler. In a sense, Ford was producing the film equivalent of Regionalist art, and who better to work with than Benton? Adler opines that Benton was a success in the milieu of Hollywood. “He was such a self-promoter,” she says. Thomas Hart Benton (1889­–1975), Lewis and Clark at Eagle Creek, 1967 Polymer and tempera on Masonite panel © T.H. Benton and R.P. Benton Testamentary Trusts/UMB Bank Trustee/Licensed by VAGA, New York, NY Courtesy of the Eiteljorg Museum of American Indians and Western Art, Indianapolis, Indiana. During World War II, Benton created a series of eight anti-Nazi, anti-fascist paintings which were picked up by the U.S. Government and disseminated as prints. His Year of Peril series, done within six weeks of the Japanese attack on Pearl Harbor, looks cartoonish, jingoistic, and downright scary. Ultimately, Adler says that the new exhibition shows Benton’s “depth and breadth” as an artist. “There was more to him than just wheat fields and workers,” she says. In addition to the almost 100 books, paintings, prints, and lithographs, the Amon Carter Museum has a substantial interactive component attached to this exhibit. Patrons can view clips of related movies (including The Grapes of Wrath and The Kentuckian) and can create their own versions of Benton’s work by staging their own scenes using painted backdrops, small artist’s mannequins, and lighting effects.